Joe Dorish Sports: Who is the Highest Paid Player in the WNBA? Who is the Highest Paid Player in the WNBA? Who is highest paid player in the WNBA? For the 2017 season we can say for sure that the player is Sylvia Fowles. 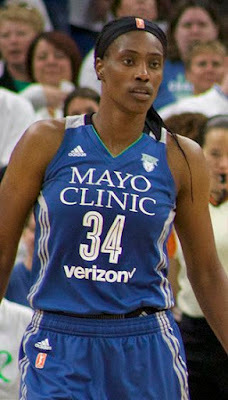 Sylvia had a tremendous year in 2017 playing for the Minnesota Lynx who won the 2017 WNBA Championship. Listed below is how much money Sylvia Fowles definitely earned playing for the Minnesota Lynx during the 2017 season. It's possible Sylvia Fowles made even more money than is listed below because WNBA teams could pay their players an additional $53,000 this season in time-off bonus money. It's possible the Minnesota Lynx paid Sylvia Fowles the entire $53,000 time-off bonus for this season but it's unlikely they did. Most WNBA teams split the bonus among different players. It's impossible to know if Sylvia Fowles got any additional time-off bonus money this season or how much she got. What's listed below is how much we know for sure Sylvia Fowles made which is the highest amount one player could earn this season. What WNBA Player Made the Most Money in 2017? As a fully vested veteran player with more than 5 years experience Sylvia Fowles made the highest possible salary for a player at $115,500. As the WNBA MVP for the 2017 season, Sylvia Fowles earned a $15,000 bonus. As a winning player on the 2017 WNBA Champion Minnesota Lynx team, Sylvia Fowles earned another $11,025 bonus. All Lynx players earned the same amount of bonus money for winning the title. Sylvia was the WNBA Finals MVP but there's no additional bonus money for that. As a member of the All WNBA 1st Team, Sylvia Fowles earned another $10,000 bonus. For participating in the 2017 WNBA All-Star Game, Sylvia Fowles also got a $2,500 bonus. All players in the WNBA All-Star Game also got a $2,500 bonus. Add up her base salary and all the bonus money she earned and Sylvia Fowles made at least $154,025 playing in the WNBA in 2017. Because Sylvia was the sole WNBA MVP winner this season and was the only player to get the $15,000 bonus for that she has to be the highest paid player in the WNBA for the 2017 season. As stated above, for the 2017 WNBA season each team had $53,000 of additional time-off bonus money to pay players. Since the time-off bonus money can be paid to one player or split among as many players as a team wants, we have to say that Sylvia Fowles earned somewhere between $154,025 and $207,025 this season which makes her the highest paid player in the WNBA in 2017 and the player who made the most money this season. While that is a lot of money to most Americans it pales in comparison to the $31 million LeBron James made playing for the Cleveland Cavaliers as the highest paid player in 2017 in the NBA. How Much Money Do WNBA Players Make Per Game in 2017?